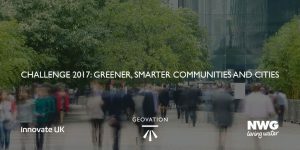 Innovate UK are lead sponsors of the Geovation Greener, Smarter Communities Challenge 2017. Niraj Saraf, Urban Innovation Lead at Innovate UK announces funding available to winners of the Geovation Challenge whose ideas we identify as having the potential to make the greatest impact. Innovate UK’s mission is to help the UK economy grow by inspiring and supporting pioneering UK businesses to create the industries of the future. We do this through funding risky innovation projects and through connecting innovators to opportunities and resources, and my role within the organisation is very much about helping businesses develop new solutions to the complex challenges facing cities. Like Ordnance Survey and Geovation, we recognise that good ideas and data to help cities overcome their challenges do not exist solely in one organisation, but in many different places. This is why we are very pleased to be collaborating with Geovation to seek ideas that can help give us smarter, greener communities. It also gives me enormous pleasure to announce that Innovate UK is to provide additional funding for Geovation’s greener, smarter communities challenge. We’re providing Geovation with £250,000, of which £185K in grant awards will be available to the winners whose ideas we identify as having the potential to make the greatest impact. This money will help them develop, launch and scale their sustainable ventures. Innovate UK has a strong track record in driving growth. For every business we have invested in, 7 jobs have been created (we’ve created more than 55,000 jobs). 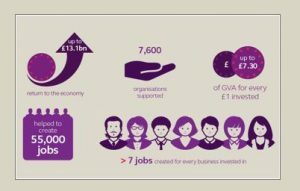 There has been up to £7:30 gross value added (GVA) for every pound we have invested, and our return to the economy has been £13.1bn. You’ve probably already heard the prediction that by 2050 75% of our global population, around 9bn people, will be living in cities. This will be close to a doubling of the current urban population, which makes the Geovation challenge even more pertinent and pressing. It’s true that a growing population can contribute to a growing economy, but does that necessarily equate to a better quality of life? What about the environmental impact? How will cities whose infrastructure is already struggling today cope? What of resilience – and not just to extreme weather, but also to disease epidemics. These are just some of the important challenges we face moving forward. Geovation is a fantastic initiative for Innovate UK to support, and I am sure this current Challenge will deliver some interesting and exciting projects. Enter the Geovation Challenge today – winners of the Geovation Challenge will receive an all-expenses paid place at a 3-day mini-accelerator Geovation Camp and Conference in London in February 2018. Here you’ll connect with smart, passionate people and test your idea with mentors, business advisors and designers in the ideal environment for it to flourish and grow.